It's 5 AM, my phone/alarm clock went off. My Santiago-bound flight wasn't even leaving till 1 PM yet I bolted out of bed quickly and took a shower. On the extra bed in my room lay all my usual travel mess: soiled shirts, soiled socks, soiled underwear, souvenirs, maps, etc. Ah that can wait. Seeing the sun rise behind Ahu Tongariki - Easter Island's largest ahu - is more exciting than dealing with packing smelly clothes. Outside is still an inky darkness, the Southern Cross above twinkling just like it did for ancient seafaring Rapanui before me. A cold breeze straight from Antarctica got me zipping my fleece jacket all the way up my neck. No one else was awake. I turned on my headlight - to steer clear from the mud during last night's rain and tell anyone out there I'm not some thief getting away from the hostel. Some dogs started barking. I walked the short distance to the main road. About five minutes later, or exactly at 5:30 AM, James pulled his Hyundai Tucson over the side of the road. I hopped in and off we went around to pick up fellow Flyertalk members Harlan, Chris and Angie who were staying at other hostels in Hanga Roa. We traveled northeasterly for the next half hour with the road completely bereft of other headlights. A few minutes past 6, we reached the designated car park still bathed in complete darkness. 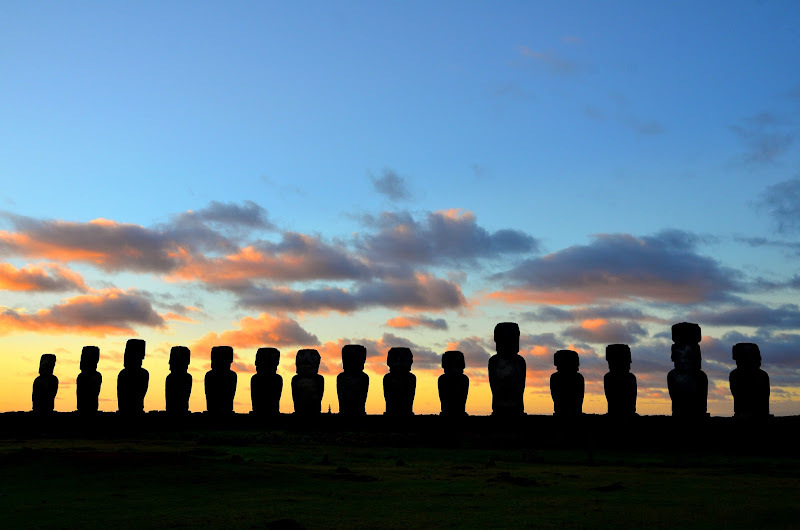 Easter Island is actually three hours behind mainland Chile but in order to align itself closer to regular banking and governmental hours, the time difference was set at two which means sunrises and sunsets are always late. We walked with our headlamps down into the plaza, the still invisible moais dwarfed by the noise of pounding surf nearby. Unlike the madhouse sunrise scene in Cambodia's Angkor Wat, there were only a few others who braved the darkness and the cold at Ahu Tongariki. It felt so eerie yet calming. These giant statues symbolized long-dead ancestors of ancient Rapanui people. The ahu itself has served as an ossuary. We sat on rocks while waiting for that moment when the sun will peek out. Slowly, as a sliver of light crept from the eastern horizon, we began seeing silhouettes. One by one each moai began to form like a giant ghostly apparition. I couldn't sit still. I was too stumped for words. This is one of those tranquil moments when man's monumental creations appeal more to our sentimental core. Silently, I snapped pictures - but really there's no DSLR on earth that could give it justice. This being almost winter in the southern hemisphere, the sun unfortunately didn't rise behind the statues but rather behind Poike, the extinct volcano just nearby. Never mind, the experience was spectacular nonetheless. Our attention shifted to Rano Raraku where these statues were born, the soft early morning sun rendering it a pinkish glow. Being the closest ceremonial platform to the moai factory, it's obvious why Ahu Tongariki is the biggest of all the ahus in the island. For about half an hour more, we stood there in awe until James prodded us - "aren't you guys hungry yet?". We got so hooked on gawking we were the only ones left there in front of the statues. We took that as a sign we needed to go back to Hanga Roa. We bid each other goodbye as Harlan, Chris and Angie still have three extra days in the island (what do I know, Harlan and I were seatmates on the return flight to the US). Back at the hostel, I headed straight for breakfast. Lory, the hostel owner, is so hands-on each morning with preparing brekkie it felt like I was eating at her own home. While she was busy frying eggs and sausages in the kitchen, her teenage daughter walked around the five or so tables making sure each guest have their share of food and beverages. Talk about mother-daughter team work! Lory came to me knowing I was leaving soon, telling me her daughter would drive me to the airport. Then I remembered the local Post Office, only a few minutes walk away. Visitors with a penchant for unique passport stamps go here to get an Isla de Pascua stamp (which reminds me of the Macchu Picchu stamp my passport earned on the Inca trail). 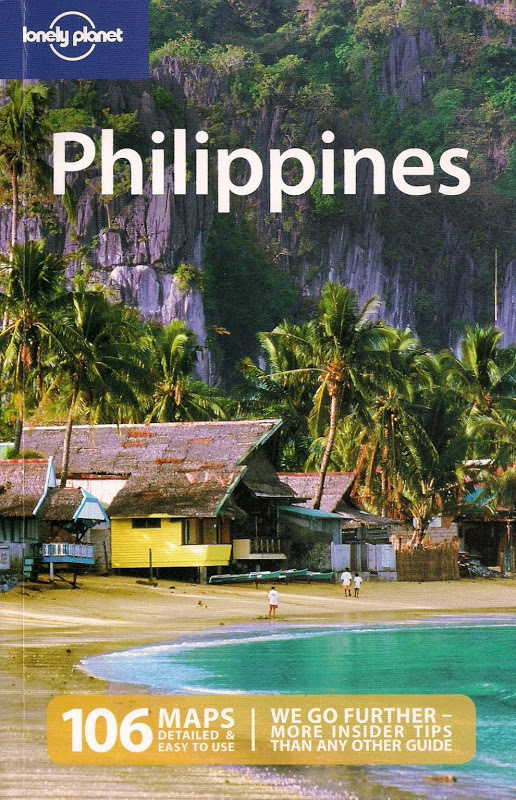 There I met a couple of Filipino-Canadians from Ottawa who were both ecstatic to learn my guide was the author of the book they used in the island. Back at the hostel again, I quickly shoved everything into my bag. Lory gave me a tight hug as she bid me farewell. Her daughter insisted to carry my bag into the car despite my protestation - it was awkward for me but what can I say: Rapanui hospitality has definitely improved a lot since the first Europeans sailed here centuries ago. I could have walked all the way to the airport but Lory would have none of that. Less than 10 minutes later, I was inside Mataveri International Airport's small terminal building. Check-in was very quick since I was the only one being served. In fact, our flight was the only flight for the day. With three more hours to kill before depature, it was a pleasant surprise to find complimentary WiFi (had to send a message to my airbnb host in Santiago). The few souvenir shops didn't appeal to me at all so I walked around and went back outside the terminal until the B767 bird landed gracefully - on the island's single runway purposely lengthened in 1987 for emergency use by NASA's Space Shuttle. Boarding for Lan Chile flight 842 was through tan open-air departure gate, the airport terminal's most interesting part. After making it through my seat and being served Pisco sour, the plane made an on-time turn-around for Santiago. In-flight service was pretty much as good as the inbound. After lunch was served, I spent the rest of this 5-hour flight watching "Les Miserables" and "Just For Laughs" (the perfect antidote for all that weeping). We landed in Santiago just before 8 PM. Since I only had a carry-on, I made it quickly to the Transvip counter for my shared-van ticket. Having used them the first time I was in Santiago, I felt at ease riding on their van again. There are cheaper buses for sure but I wanted to get quicker to downtown Santiago. Transvip to my airbnb's host address cost 5,500 CLP (or about 10 USD), taking nearly an hour. Of the seven passengers in the van, I was the only non-Chilean caught in a crossfire of Spanish. Everyone was on their mobile phones yapping about where they've just been. The driver turned to me asking for the exact address which he then entered into his GPS. This was my first airbnb booking so I was quite excited at the prospect of finding my host. Google luckily has "street view" options on their Santiago map so a few days before arrival I was able to visualize my host's immediate neighborhood - even the exact door number to their apartment building. Once the van turned at a corner, I knew I was in the right place, blurting out confidently "por favor, para aqui!". As soon as I rang the doorbell, my hosts knew I have already arrived. It was almost 9 PM. Katerina and Gary greeted me warmly to their 3-bedroom apartment perfectly located right in the heart of historic Centro. Bellas Artes subway was just 2 blocks away while the Plaza de Armas was just as near. Katerina showed me to my small room with an attached toilet. Bathroom was in the hallway. For $19/night, cost was quite reasonable. As a host, Katerina was thoughtful. She prepared maps of Santiago and Valparaiso for me knowing beforehand I intend to explore both cities. Gary asked if I had dinner. "Nope, my last meal was about 4 hours ago in the plane", I answered. It turns out the couple wanted to eat at their favorite Peruvian restaurant nearby so I went walking with them. What's funny, they're not even Chileans. Katerina is from Czech Republic while Gary is from Peru. They both fell in love while toiling in their adopted city and have since decided to live together. While feasting on Peruvian sandwiches, our conversations turned naturally to their respective motherlands - two countries I have previously visited - and of course, where I came from and where I now live. Knowing my hosts the first hour couldn't be better than this. So glad to be back in Santiago. Oh, you're finally going to Valparaiso! I enjoyed that city, I think you will too! yes I had a great time in Valpo even if it's just for a day. "Silently, I snapped pictures - but really there's no DSLR on earth that could give it justice." ~ I beg to disagree with your statement! Those silhouette-shots are incredibly beautiful! Nat Geo photographers would be envious of you, Dennis! Another postcard-worthy set of pictures! Thank you Doc Gelo! Am not sure about Nat Geo getting envious of my photos but I had to bring a tripod on this excursion since I knew my shaky hands won't handle well in dark settings. how long did you stay in easter island again? Was there for 5 days. Your sunrise photo of the ahu is sublime. It was definite worth dragging yourself from bed very early. The daylight shot below makes it even more interesting. Can't wait to read you take on Valparaiso. I was there about 9 years ago. It was still a bit on a rough side and on a verge of gentrification; the artistic types were just starting to make their presence know in the city. I bet its a lot more gentrified by now. Hey Marisol, thanks! There are not much things in life that require so early a start but this one was so worth it. As for Valparaiso, obviously I couldn't say anything about changes since it's my first time - I'll let the photos speak for themselves soon. I don't doubt you will Jeff! Love your photos, as always, Dennis. 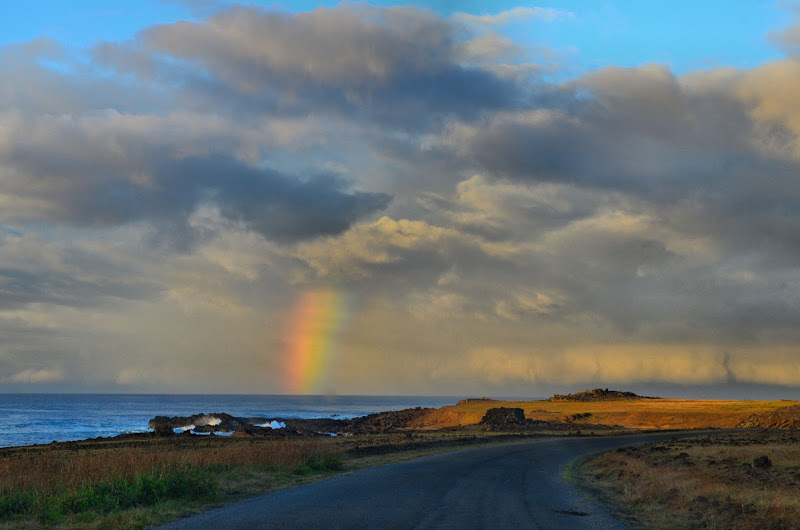 That rainbow shot was a good capture, but my fave is the silhouette shot in Easter Island. I am really really looking forward to go to Santiago next year. I'd probably be hosted by a Santiago blogger, as one has offered already to take me in. Hope to meet you someday! Thanks Aleah! Am looking forward to meeting you someday too. Since you will be visiting Chile, I suppose you'll be embarking on trips to SA countries not requiring visas to Pinoys: Brazil, Bolivia & Peru. If not, Chile alone is already an epic destination.